Watch-ya wanna buy in Tehran’s big bazaar? 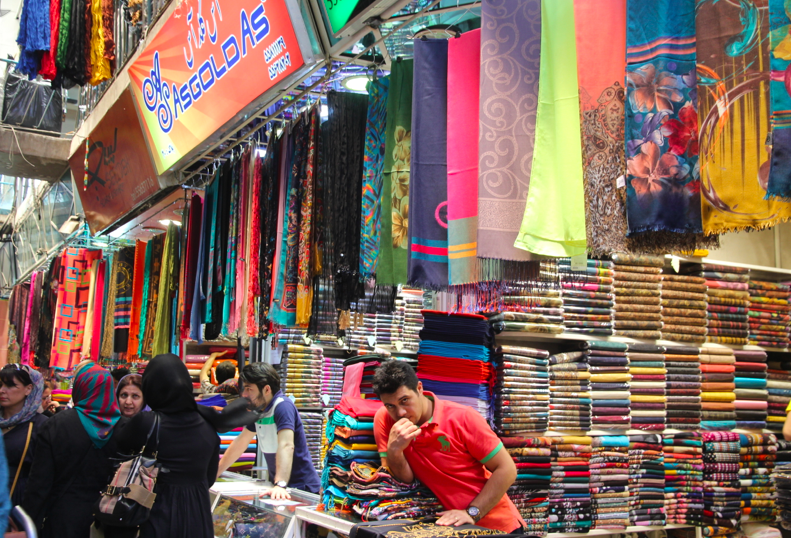 Tehran’s main bazaar might not be one of the most beautiful markets in the world, but you can buy almost everything you need. 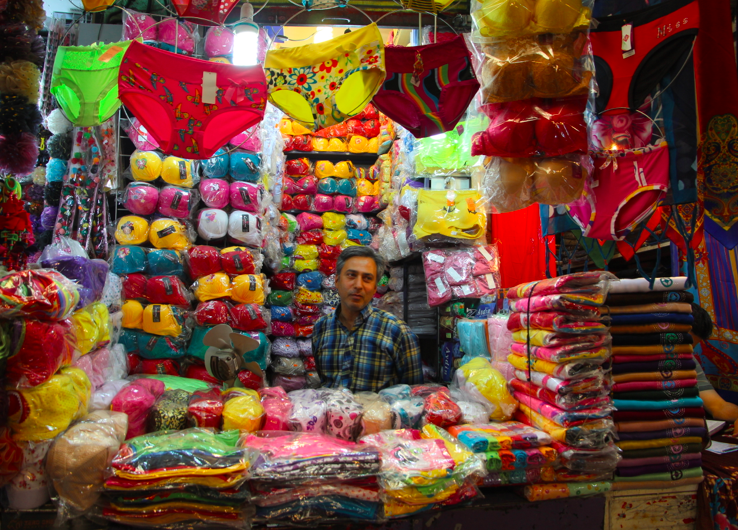 It’a one of the world’s largest bazaars with about 10 kilometres of covered shopping and plenty of outdoor stalls too. Poor John and I spent half a day wandering the labyrinth of corridors getting ourselves lost and then found—and finding lots of unexpected gems as we explored. For starters, we replenished our supplies of dried fruit and nuts, and I found a headscarf that didn’t make me look too frumpy. It’s black, red and gold and has sort of an Aboriginal design. I might even wear it in public in Australia. It’s compulsory throughout Iran for women to wear a headscarf—or even the full shapeless chador rig with or without face covering, which is way too hot in summer and not expected of foreign women. I brought two scarves with me from Australia, but neither quite covered my head, hair AND neck, so a better version was required. I was also tempted by, but resisted buying, some fabric or a large men’s shirt (to cover my bum). In addition to a headscarf, a woman who doesn’t wear a chador seems to be expected to wear a jacket that is long enough to cover her bum. Good grief, I’d brought black trousers and black, long-sleeved (but not very long) tops, and figured I’d wait until someone complained about my outfits before I bought yet another layer of heat in summer. No one ever said a word. We also ignored the touristic trinkets. There are plenty of wonderful temptations, but after years of travel, we already have too much of this stuff at home. The evening gowns were most impressive and most unexpected, but I resisted buying one of them too—not really right for camping. I’m still wondering who buys these shapely, slinky, low-cut numbers festooned with beads, sequins, ruffles and glitter. 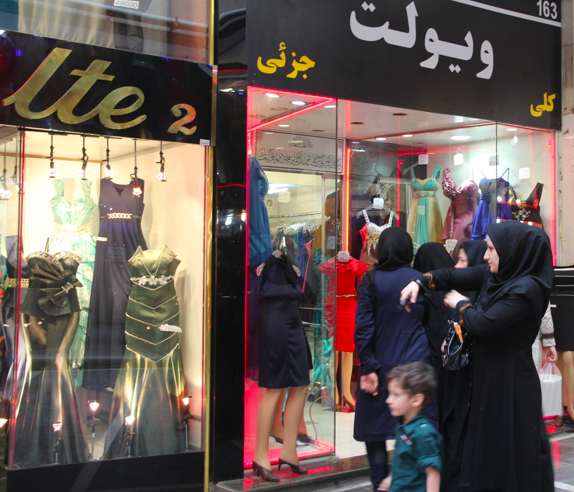 I saw plenty of women in chador lingering before the displays of gowns, and I asked in several shops as to when and where people might wear such get-ups. But the language barrier was too great to get an explanation. I can only imagine that headscarves, long jackets and chadors are not required in the privacy of one’s home, and that a dinner party among ‘consenting adults’ would be the perfect place for a plunging neckline. So skipping the party clothes, I was especially pleased to be able to resurrect my watch. You may remember that my trusty watch of ten years fell off my wrist—and was lost forever—in Sydney’s airport late last year. Luckily, I had a convenient spare in my backpack. It’s a Timex and, while it’s been mostly okay, it’s also been a nuisance. I love the watch’s beautiful big face, large readable numbers and sweeping second hand. Plus when I push the winder spindle in the middle of the night, the face lights up and I know how many hours I have until I have to crawl out of my sleeping bag. All these good points reminded me that when I was a child, Timex’s promotional slogan was ‘takes a licking and keeps on ticking!’ I vividly remember the watch being tied to the blade of an ice skate and being whizzed around the skating rink, and then shown to still be keeping good time. Clearly, I didn’t get that watch! Within a few months of normal wear, the face edges had chipped. I can live with a few chips, but not when the shards lodge under the face and stop the ticking. I could shake the watch to re-distribute the shards and get the hands going again, but I was always wary as to whether the time shown was accurate. Then one of the pins holding the watchband in place fell out. Hmm, and I hadn’t even gone to the ice skating rink in Dubai! But Dubai is the land of copies, so I packed away the Timex and purchased a cheap Rolex copycat that was way too dressy for my wardrobe of camping clothes. 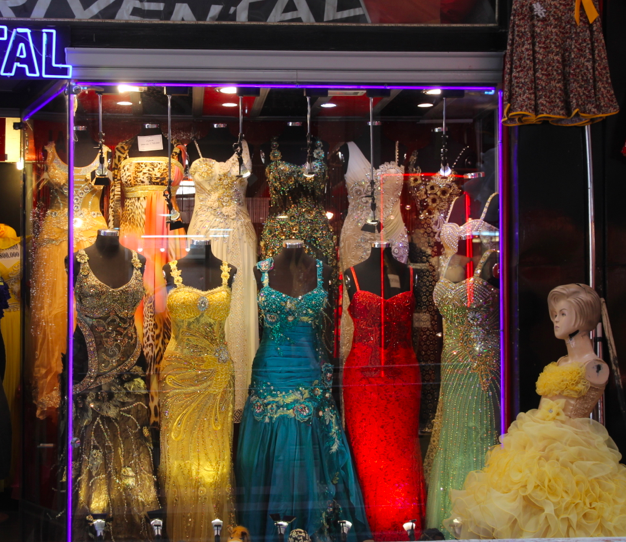 Maybe I should have looked more closely at the evening gowns in Tehran. 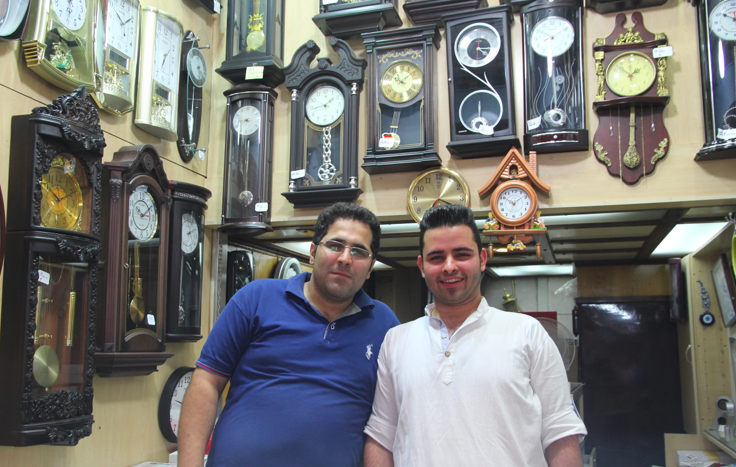 That said, the Tehran bazaar came to the watch rescue. Early in our wanderings, Poor John found a proper clock shop. They couldn’t replace the face, but they were happy to provide a pin for the band—for free! Later in the day, we found a proper watch shop and—yes—for a mere $5 they could replace the face by the next day. Our challenge was going to be to find the shop again, which we did—eventually. So I’ve got a watch again that doesn’t need sequins to go with it. Sadly, the frequent and extreme changes in temperature (from boiling hot in the desert to the air conditioning that’s available occasionally in hostels) have caused the watch face to crack, so I’ll need to go replacement shopping again in one of the Stans. I’ll keep you posted. Looks amazing! So vibrant and colourful. Iran is high on my list. Iran is well worth a visit. The headscarf business for women is a pain in the neck, but everything else is great. What an amazing shopping experience! Ten kilometres of shopping and so much to choose from. I could get lost for days in that sort of bazaar. I guess I’ll just keep vicariously enjoying it through your trip. Syria is one of my favourite places in the world. Our first daughter was born in Damascus. Iran is great too. I promise to post a heap of entries for both Iran and Syria. I still can’t balance the war in Syria and the wars in Iran and Iraq with the apparent freedom with which you seem to wander from hot spot to hot spot. We try to avoid danger. Plus, I have been very fortunate to be in the right places at the right times. Egypt in the 1970s, Syria in the early 1980s and again in 2009, and Nigeria, Mauritania and Mali in 2009. We have only just left Iran, which is very calm and welcoming these days. Our most dangerous stint was in Beirut during the Civil War in the late 1970s and early 1980s. And really, we just had to be sensible about where we went. I have yet to visit Afghanistan and Iraq. Poor John visited Baghdad in the 1970s. We planned a trip to the swamps there for 1980, but the war broke out and we never went. Maybe someday. Thanks for responding so quickly.You’re having a loverly time, I wish I were there. Thanks for pointing out the link between fancy dresses and fancy underpants. They do go together. 🙂 And I forgot to mention the long sleeves and the temperatures over 40°C. 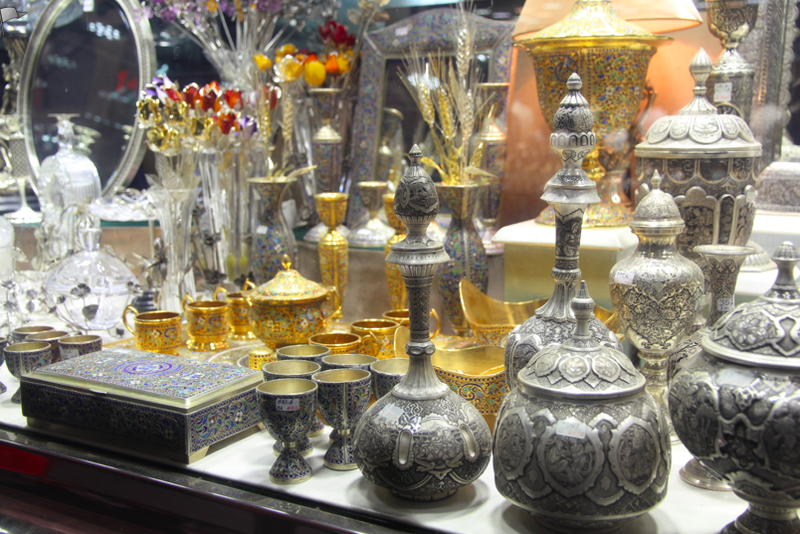 How lucky you were to visit Tehran – maybe one day. Iran is amazing. We had such a wonderful time and were always welcomed and always made to feel safe. We have a large group of ‘Persians’, in Houston and they are delightfully warm- hearted. That’s exactly what I would expect.